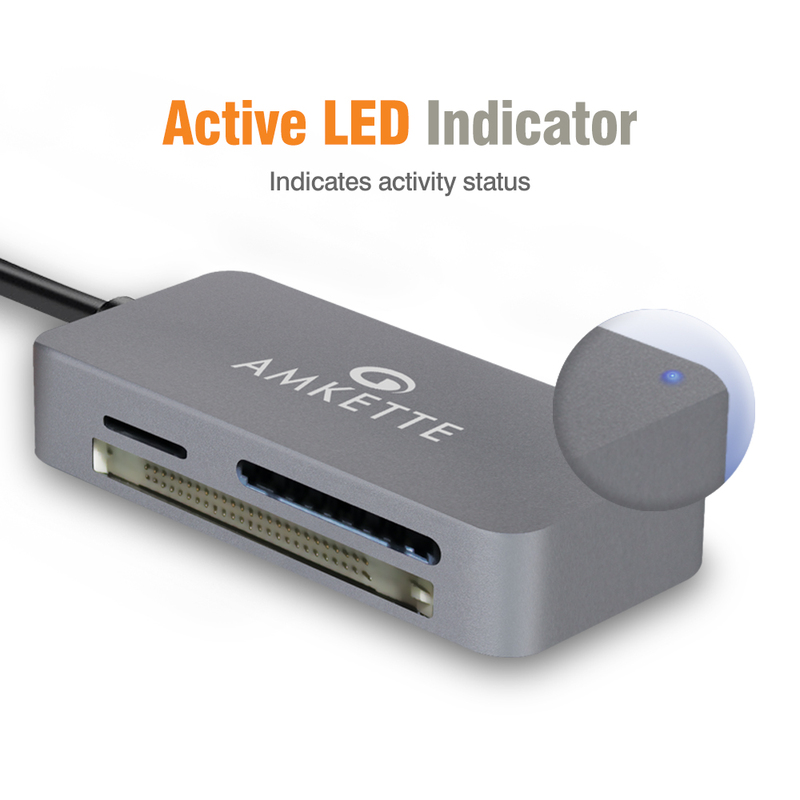 ⇒ Active LED indicator for card insertion and data transfer. 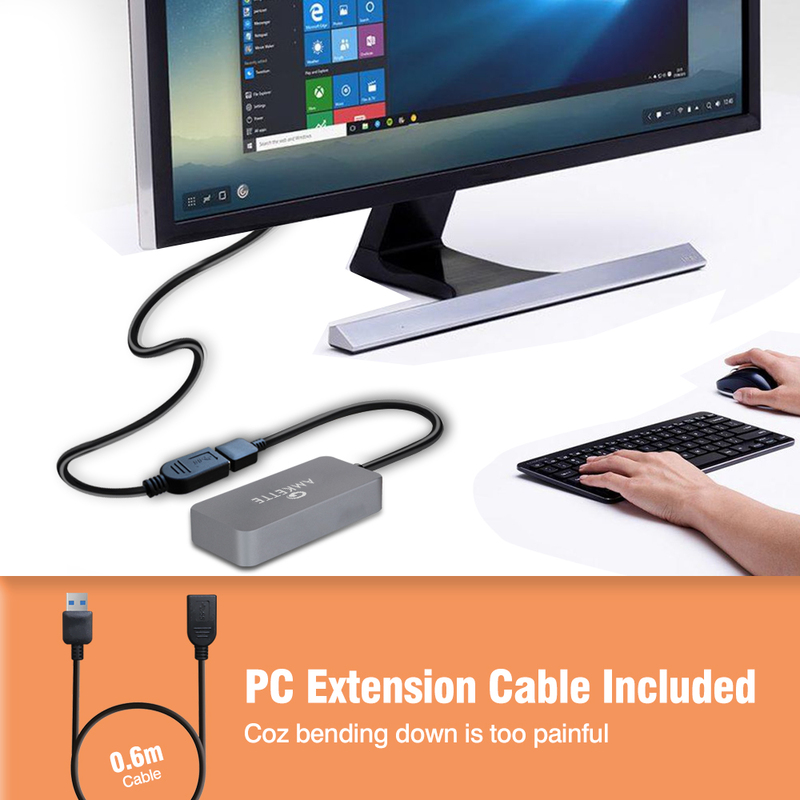 Designed for Laptops and Desktops: Carrying a Inbuilt 0.2m cable and an additional 0.6m USB3.1/3.0 PC extension cable this card reader is ideal for both laptop and desktop users. Sleek Profile: Space grade Robust Aluminum body with slim and sleek design, extremely durable and a great kit for travel and office without taking up too much space. 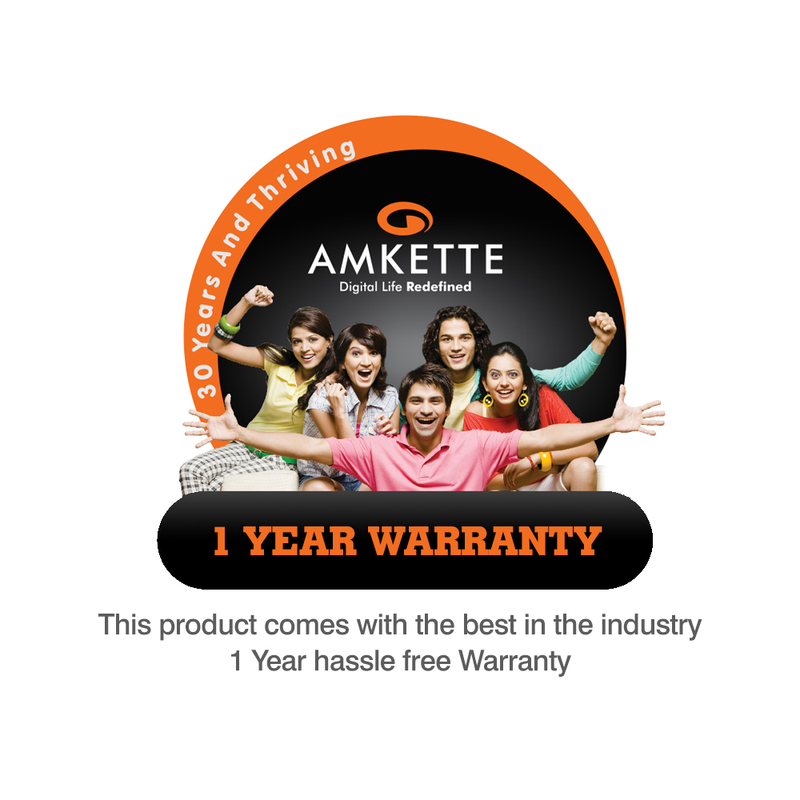 Amkette USB 3.1/3.0 Universal card reader supports all major card formats making it ideal for photographers; videographers; design studios and printing houses. This high speed and robust card reader lets you easily transfer photos; videos; music and other data between your favorite cards and your PC. 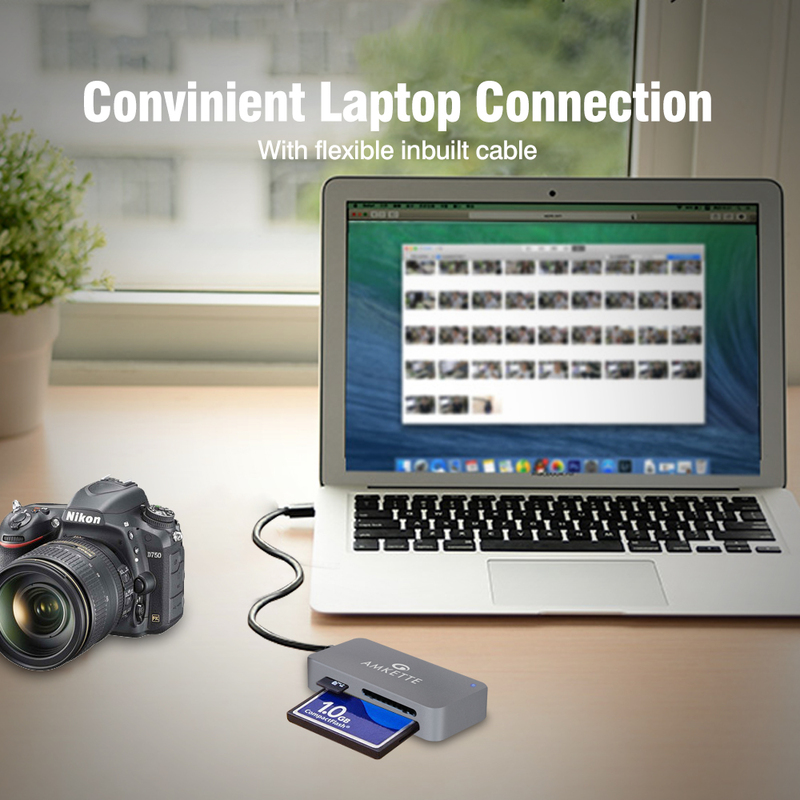 To maximize the performance of your memory cards and save time when transferring files; it features USB 3.1 Gen-1 interface with up to 5Gbps data transfer speed; which is 10 times faster than USB 2.0. 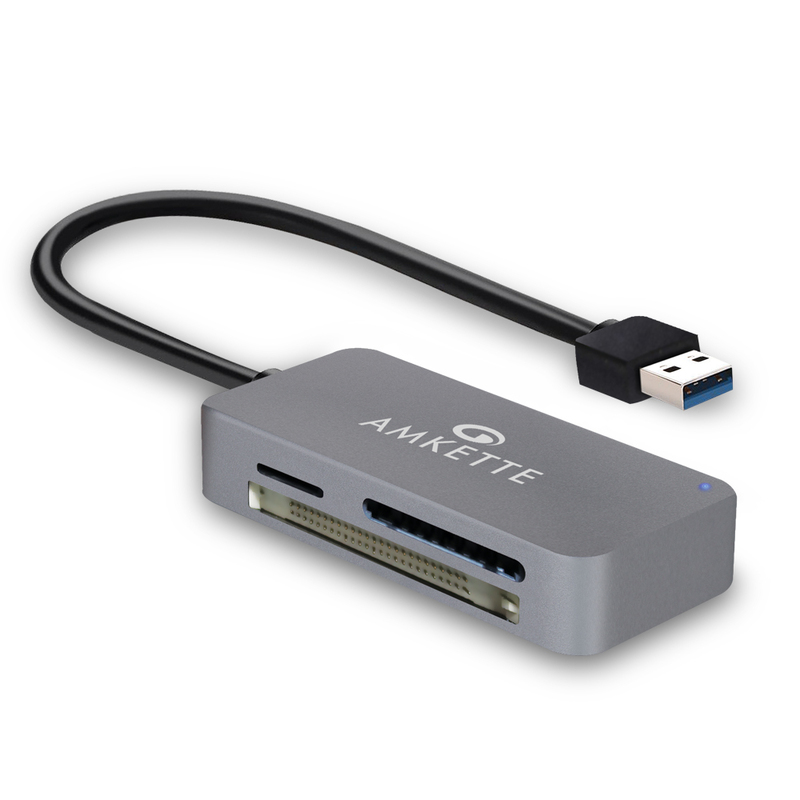 Its backwards compatible with USB 2.0 ports; which is convenient for systems with limited USB 3.0 ports. 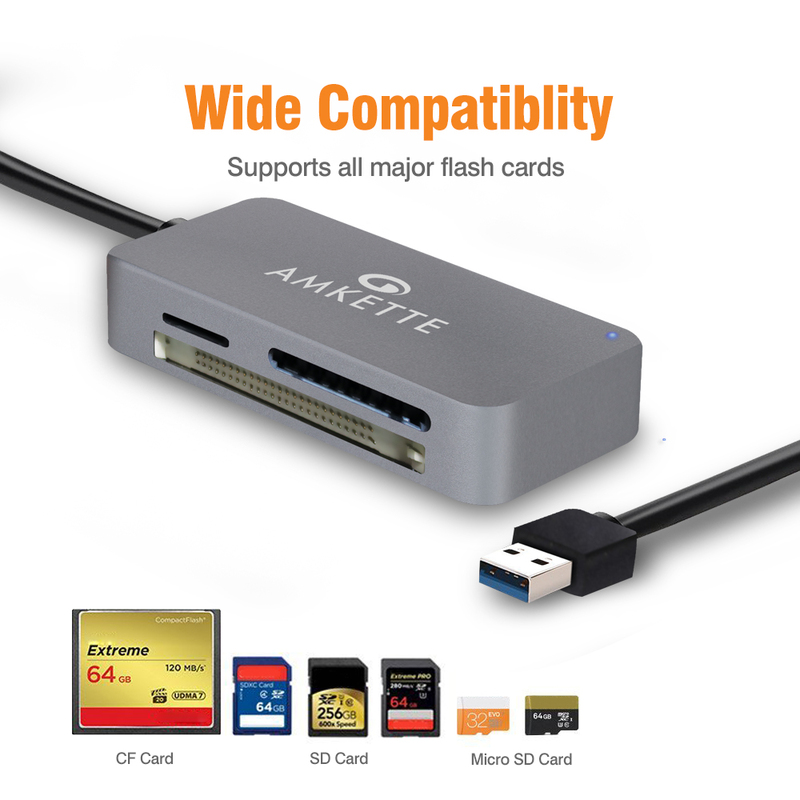 Amkette USB 3.1/3.0 SuperSpeed Universal Card Reader provides 10 times faster data transfer speed as compared to older USB 2.0 card readers, it allows you to easily add a USB 3.0 multi-slot card reader/writer to your USB 3.0 enabled system, with a flexible inbuilt 0.2m USB cord for Laptop connection and an additional 0.6m PC extension cable for Desktop connection making it ideal for both laptops and desktop users. Active LED indicator for working status, “ON” when connected, “FLASHING” when transferring data. Cable Cord length: 0.2m Inbuilt + 0.6m PC extension cable. Note: To maximize the performance of your memory cards this card reader reads only one card at a time. Slim and sleek design, great kit for travel without taking up too much space. Small and compact with anodized Aluminum casing protect from electromagnetic interference. Is the driver required to use card reader? No, you do not need to install extra driver when you use the card reader. Can this card read the UHS-II card? Yes, but the transfer speed is limited to UHS-I bandwidth. Does this card reader support MS card (Memory Stick)? No, Memory Stick (MS) is not supported by this card reader. Can this card reader read two cards simultaneously? No, this card reader can only read only one card at a time. 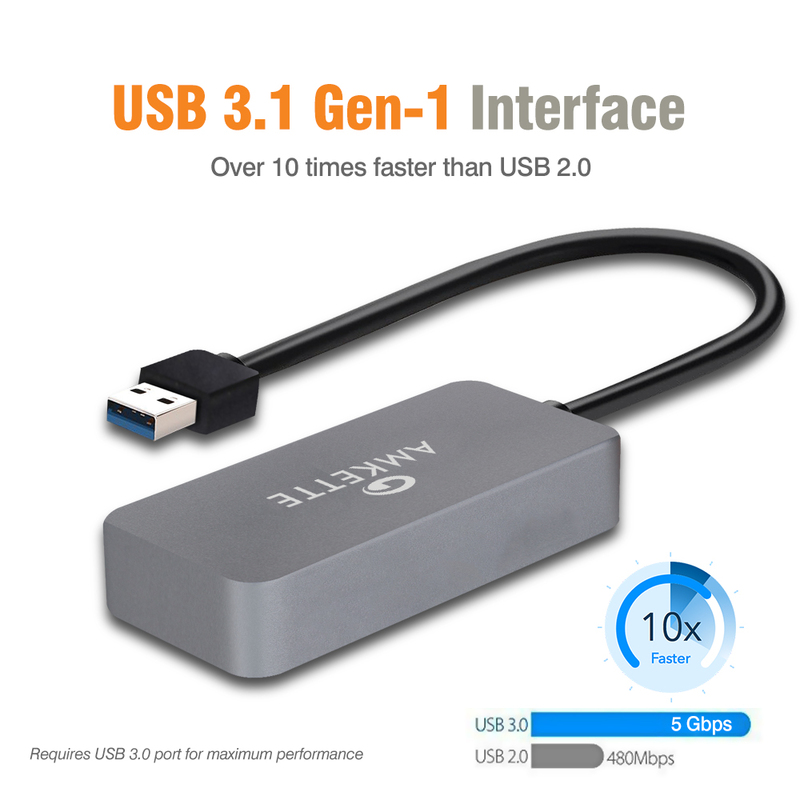 -USB 3.1 Gen2 (SuperSpeedPlus): an impact on the transfer speeds (double the theoretical bandwidth of up to 10Gbit/s). No, USB 3.1 is the USB specification, whereas Type-C is merely a USB connector type. Why can't the card reader reach USB 3.0 speed? Generally the blue color USB port on your desktop/laptop are USB3.1/3.0. port from your host device manufacturer..